Do you already own a vehicle? Perhaps most of you will say yes, but how about an off road vehicle like UTV? UTV stands for "Utility Task Vehicle". It is also otherwise known as "side by side" vehicle which is actually a small two or four- seater drive off road vehicle. Did you ever fancied for a UTV vehicle? I do! If you got a big piece of land, then UTV can be very useful in transporting things and is especially good on agricultural areas. Do you know that one of my dreams is owning a farm and a rest house in a huge land, where I could grow vegetables and tender flower gardens? That would surely bring me a relief from a hard day's work and could very well serve me during my retirement. UTV can be very useful to me then. UTV could also be used as a recreational vehicle. But since an off road vehicle is an open type, the most common concern is it's safety. As safety remains to be the name of the game, it is important that we observe safety measures such as driving slowly to avoid overturns, observing maximum number of persons allowed inside the vehicle and ensuring that side by side UTV parts were properly installed and additional features and devices are added up for maximum security. 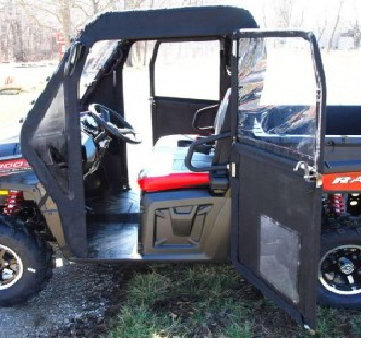 One safety measure that I know is installing a UTV cab enclosure. This could surely protect you off the road. Apart from that, there are also UTV cab heaters which will keep you feel warm on the road during an extremely cold weather. UTV's are undeniably useful in so many ways. Having an ample storage space, the ability to safely carry more than one rider, provision of finding you a reasonable way to pack your things along for a camping, a hunting ride or simply a stroll around the farm, are only some of the many benefits that we can get from owning a UTV. It is indeed a best fit for our basic and recreational needs. That what makes off road vehicles a winner!